We have seen a rise in wedding couples contacting us specifically to do a Day After session due to a bad experience with their wedding photographer on their special day. It breaks my heart to hear these stories, and it is so scary to think how many weddings are not properly being captured due to new photographers who don’t have decent time management or event coordination skills (and you thought all we did on the wedding day was take pretty pictures? Ha! I wish!). So when I saw Ciera’s email about her recent wedding photography experience I knew I had to turn her bad experience into something fun and romantic! I love when couples opt for a Day After portrait session sometime after their wedding day. While it is called a “Day After” session (or some people call it a “Trash the Dress” session even though the dress usually is not harmed), it usually takes place anywhere from a month to one year after the wedding. Not only do they get more images all decked out in their wedding day attire, but they get a beautiful experience with each other to always remember. 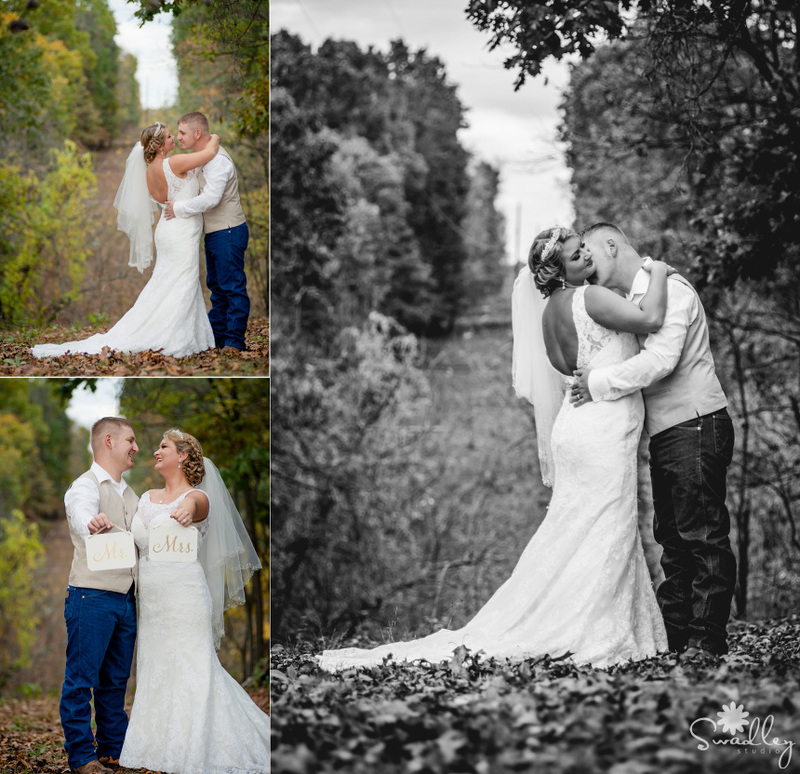 Ciera & Bubby were married at their home in Bunker Hill, WV, so we decided to do the session there as well. They have a beautiful piece of property, and we took full advantage of the gorgeous fall leaves! 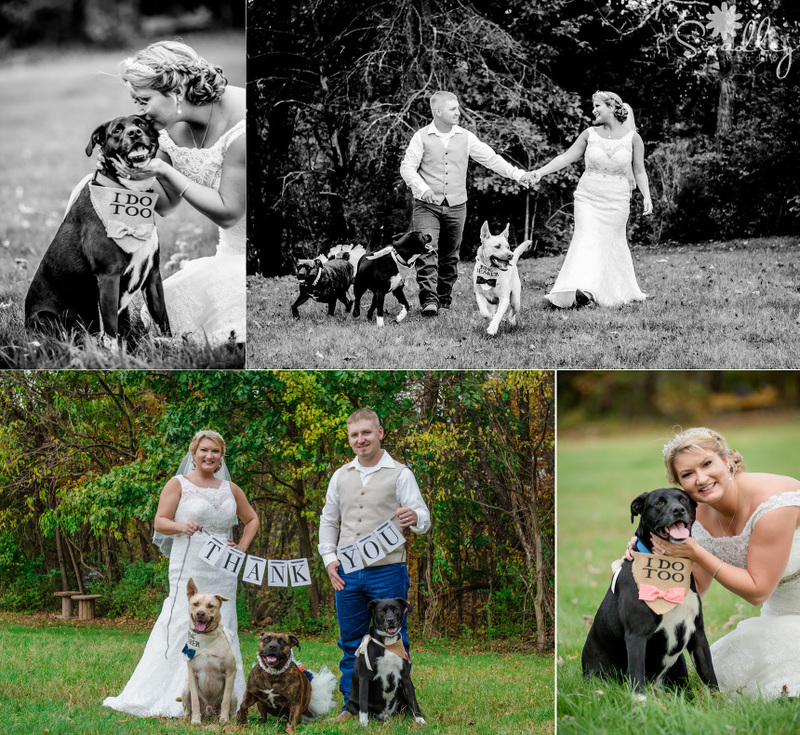 Since their dogs had important roles in the wedding day, I thought they had to be included in this session as well! This was a SUPER ROWDY bunch of pups, but man how stinkin’ cute!!! Thank goodness for treats and lots of patience!!! Thanks for following along on our photographic journey! If you would like more info on our wedding photography, use the contact form at the top of this page to request our wedding information. We also shoot senior portraits, newborns and headshots and would love the chance to work with you! Follow us on Facebook, Instagram, YouTube and Pinterest to get updates on everything happening here at Swadley Studio!